The biggest event in DC Comics history is coming to the CW this year. Tony Todd is still angling for a place in the new Candyman. Get a look at the final episodes of Shadowhunters. Now it’s Tim Allen’s turn to wrap on Toy Story 4. Plus, what’s coming on The Orville, how the new Riverdale spinoff will stand apart from its sister show, and what’s next on Gotham. Spoilers get! Tony Todd confirmed he still hasn’t been approached to appear in Jordan Peele’s Candyman remake in a new interview with Entertainment Weekly. I know he’s a fan. We’re waiting just like the rest of the world. I’m hoping I will appear in the film in some form of fashion. Wouldn’t that make sense? But it’s Hollywood, so I won’t take it personally if for some reason it doesn’t work out. If this new one is successful, it will shed light back on the original. I think the subject matter is more important than any individuals. And I mean that. The Are You Afraid of the Dark? movie has swapped release dates with Ang Lee’s Gemini Man, and will now hit theaters one week earlier than anticipated. It’s new release date is October 4, 2019. Tim Allen has wrapped recording on Toy Story 4. Relatedly, Pixar has announced a sneak peek will air this Sunday during the Super Bowl. Young mother Sarah encounters a mysterious figure in a new clip from Lee Cronin’s The Hole in the Ground. A poet and a monk join forces to investigate a demonic cat in the trailer for Legend of the Demon Cat, opening later this week in select cities. We also have a Japanese trailer for the seventh and final film in the Space Ship Battle Yamato series. During a presentation at the Television Critics Association conference, Alex Kurtzman revealed the show’s writing staff has already moved on to season three. We’ve started thinking about season 3 already. We’re cutting the [season 2] finale right now. I can’t wait for you guys to see it. We’re really proud. So we have a lot of big ideas we’ve already started working on. You have to start thinking about season 3 in the middle of season 2. That’s just how I make television. Did you catch our latest recap? It will be the biggest and most complicated [crossover yet]. That is the intent, to take some big swings. Can’t tell you if it’ll follow the comic book version, but it’ll take some big swings. We’re talking about a number of different ways to go. 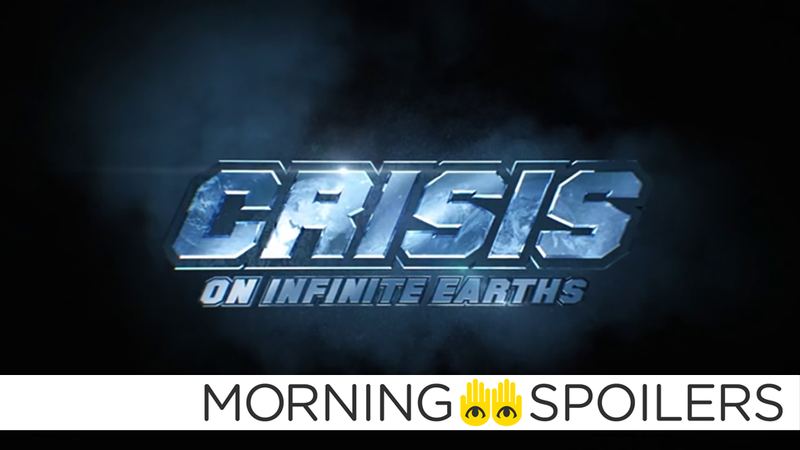 It is Crisis on Infinite Earths, and if you know the history, things collapse. Pedowitz also confirmed the upcoming Katy Keene spinoff series won’t be crossing over with Riverdale. Katy Keene takes places years after Riverdale High School. There are no plans to do anything [regarding a crossover]. Any of the Riverdale characters who come to Katy Keene will be older. Robert [Aguirre-Sacasa] is getting the pilot right. Freeform has released a trailer for the final episodes of Shadowhunters. Bane gets his namesake in the trailer for “13 Stitches,” airing in two weeks. Meanwhile, Jeremiah teams up with the Mad Hatter in the synopsis for “Ace Chemicals,” airing February 21. Finally, “the most insane thing that’s ever happened on this ship” may-or-may-not occur in the trailer for “Deflectors,” The Orville’s Valentine’s Day episode.